Before a World War 1 German officer can use a spell book to summon Krampus, he is shot by American soldiers. After the American soldier in possession of the book is killed, his effects are sent to his widow, a teacher at an orphanage, where a curious student finds the book and unleashes Krampus. 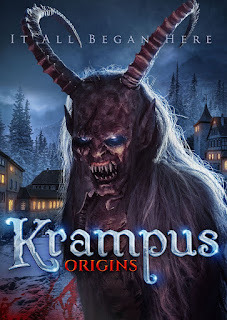 For a film bearing the title KRAMPUS ORIGINS, little is seen of Krampus or learned about his origins. The runtime of the film is just under 1 ½ hours and Krampus doesn’t appear until approximately the one-hour mark. Krampus’ minor onscreen time is spent holding a flaming staff and speaking menacingly with a gravely, barely understandable voice. Krampus’ design is also underwhelming, turning him into a generic, glowing eyed, armored figure, with only his curled horns being indicative of the Christmas demon. Most of the film concerns itself with the lives of the orphanage’s staff and children. While the acting is not particularly bad, the cast does not have the finesse to give the characters any emotional resonance. They are simply one-dimensional stereotypes. The one exception is Katie Peabody as Josephine, the widowed teacher, in her scene receiving the news of her husband’s death. Her reaction was conveyed quite well and was very believable. Though no technical achievement, KRAMPUS ORIGINS is competently filmed but very static. There is no energy in the shots. The minimalistic setting appears unlived in, too sparse, with sets barren of objects and resembling a stage play rather than a film set. With very few scares, little sense of danger, and a tedious story, KRAMPUS ORIGINS has little to recommend it.